1,000,000 likes will save this poor kitten! Filed Under facebook, how to grow your audience, like my page. How often do you see pages that have such an awful title on Facebook? Once a day? Twice a day? Depending on who you’re friends with, you might see them more than that. Annoying aren’t they? But, have you looked at how many likes the page has? Or how many likes the picture of the cute kitteh playing with a dog has got? Or how many shares that picture has got? Look really carefully. Take a look at this page but please, for the love of God, do not like the damn thing! 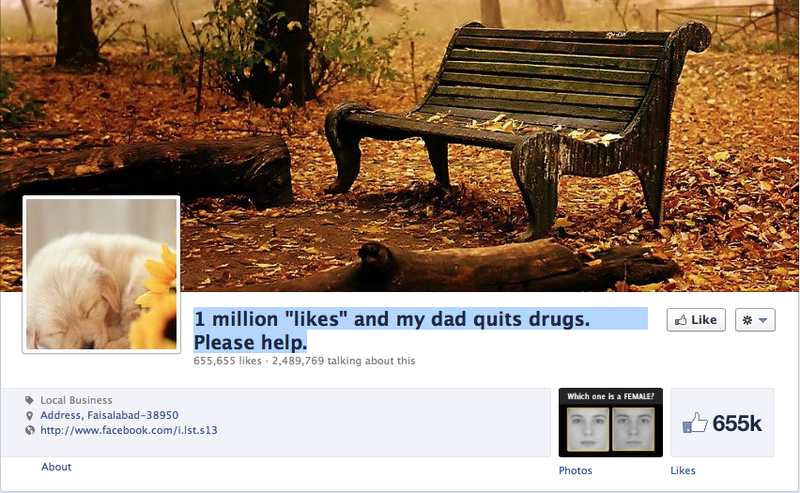 Aside from the fact that 655, 655 people like the page – I mean, what are the odds that I’d find it at that number? – is a cool coincidence. The fact that 655, 655 people like the page is astounding! Not only that, but 2, 489, 769 people are TALKING about the page. That means they’re commenting, sharing, suggesting likes, inviting friends etc to take a look at this page! When you read through the page, nothing on it has anything to do with drugs. There are pictures of kittehs azking if dey kan haz toona, ‘which one is female’ photo comparisons, good looking models; female and male, firemen with six packs and so on. Every single one of those pictures has an amazing number of likes, shares and comments. So, what’s the point of this post and – more importantly – what’s the point of those pages? Marketing. Money. Money and marketing. If you use Facebook you’ll know that you can create pages at any time and then change the name of the page at any time. This means, that if you can get 1,000,000 schmuks to like a page, you have a page that has 1,000,000 feeds into what is essentially a captive market. Let’s say I create a page that says a number of kittens and puppies will be killed unless I get a million likes, and I get those million likes. I can then approach Umbrella Corp and say ‘I have this very popular page. Want to buy it?’ What company wouldn’t want a page with that many people liking it and talking about it? All they have to do is sprinkle pictures of kittens and puppies in amongst their product placement, or sprinkle their product placement in amongst kittens and puppies and they’re going to get more exposure than they can shake a stick at. I’m almost tempted to do it myself, but right now my morals and ethics are threatening to punch me in the balls. Now there’s a title! 1,000,000 likes and I’ll film myself getting punched in the balls! NOT.